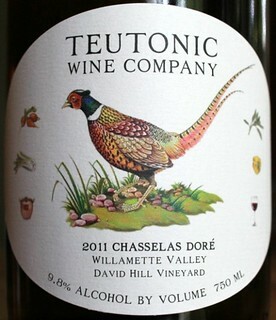 The Teutonic Wine Company’s 2012 Chasselas Doré is sourced from a single row of 46-year-old vines at the David Hill vineyard. I’ve long been an admirer of the David Hill wines, notable for their vivid acidity, precision focus, and beautifully-modulated white wines. But a Chasselas from Oregon? That’s a new one on me. And this one is spectacular. Though the alcohol is under 12%, the wine has no sweetness other than the lovely ripe fruit. Spontaneous fermentation is employed, and it seems to add delicate but important nuances – floral, aromatic, and textural – to the mouthfeel and flavor. The richness of this wine is astonishing – it just explodes with flavor. Streaks and layers of honeysuckle, bee pollen, peach, golden apple, apricot, butterscotch... OK, I’ll stop there, but the wine does not. This is really a joy. Even after being open for three days the wine still delivers the goods. I do not have any other experience with Teutonic wines, but I look forward to tasting through all of them. The website profiles many of them, and every single one sounds like a wine I’d like to explore. There’s an estate-grown Pinot from the Alsea vineyard, located west of the Coast range, close to the sea. Something called Feine Mischung, a blend of Muscat, Gewurztraminer and Pinot Noir. Pinot Gris from Maresh vineyard, and Pinot Blanc from David Hill. A Pinot Meunier made as a still wine. And much more. About the Chasselas the owners write “Oh Chasselas oh Chasselas, why can't we make more Chasselas? Because there are only a few rows of this fruit at David Hill Vineyard and we can only make one barrel of the wine. We're lucky we can make it at all as it used to get thrown into various blends. This wine is in very limited supply so if you're lucky to find a bottle, stash it away for a couple years before drinking – Chasselas peaks after several years in bottle.” Oh well... too late for that! Bottom line is this – here’s a very promising and creative angle on Oregon viticulture, taking it in a new direction, one that can only add to the prestige and importance of all the outstanding winemaking already in place.